Dyna-Ski Boats: Ethanol Fuel bad for your boat and other off road engines? 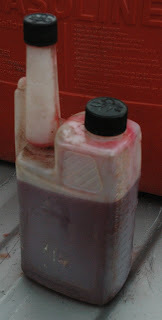 Ethanol Fuel bad for your boat and other off road engines? Since gasoline with ethanol added came onto the scene I have tried to avoid using it. I check my vehicles miles per gallon (MPG) every time I fuel up. I noticed about a 10% drop off in my 1999 Chevy Pickup and 2000 Suburban MPG when I could no longer easily avoid gas with up to 10% ethanol at the pump. Both vehicles had the 5.3 liter V-8 engine, automatic transmissions and 3.42 gears. Pickup is a two wheel drive and the sub is four wheel drive. When I'm towing the loss in MPG is even greater with the ethanol added fuels. The heavier the load the worse the MPG. Much worse than with no ethanol added gasoline. A few years ago I replaced the 1999 pickup with a 2004. The 2004 has the 5.3 liter V-8 engine, automatic transmissions and 3.73 limited slip gears. The 3.73 geared pickup seems to be much better for towing than the 3.42 geared pickup was with no running empty MPG penalty vs the 1999 pickup. Actually now that I think about it the 2004 is much better than the 1999 pickup was overall on fuel and comfort wise. I read articles in various places including Consumers Reports, some online magazines and other sources about the effects of ethanol in gasoline. What I read is not good. My marine mechanic friends tell me a lot money is made by marinas and small engine service places because of gasoline with ethanol in it. Ethanol attracts moisture concentrating its corrosive effects. Ethanol also tends to settle out of gasoline which is even worse. It is very hard on the older fuel systems. It tends to be worse on engines with carburetors. Not to mention all the engines that are just ruined. The Environmental Protection Agency (EPA) bans gasoline with 15% ethanol from lawn mowers and other power equipment. Seems the 15% mixture causes the engines to run hotter and causes engine failures. According to the EPA even the 10% ethanol can help destroy engines. So the higher the ethanol content the harder it is on the engines. Ethanol attracts moisture which really means water. The effects of mixing water and gasoline was bad in the past and still is. Moisture in the gas line is what helps to cause gas line freeze in the winter. Remember that old problem? It is the reason we added products called "heat" to our vehicles in the winter when it was real cold outside. So now that I've told you how bad that ethanol is in gasoline you are wondering what you can do to help prevent problems in your boat and other engines perhaps? So I will tell you what I do and a few other related things. I wish I could use the non ethanol gasoline in my vehicles but that is not practical and cost effective so far. I avoid ethanol gasoline for all my small engines, boats, snowmobiles, my 400 cubic inch V-8 hot rod and 1970 plow truck. I have spent time searching out sources for non ethanol fuel. It is posted right on the gas pumps and has to be according to the law. Around here some gas stations sell premium without ethanol in it. It is more expensive but I feel it is worth it. All gasoline without ethanol is going to cost you more money it seems. You will save money though when you don't spend time or money fixing things later. I have also found that Fleet Farm sells non ethanol mid grade and premium at their gas stations. There are a couple gas stations that sell regular no lead without ethanol but they are few and far between. I have noticed some gas stations near race tracks sell better grades of gasoline. One of my friends uses aviation fuel. He works at an airport. Some retailers even sell non ethanol fuel by the quart which is really pricey. The companies selling gasoline to the farmers for bulk delivery offer gasoline without ethanol to their customers. So in many cases, the farmers are not even using the stuff they make money on indirectly themselves. Seems it messes up the older engines found on farms! I have considered a bulk gasoline tank but there does not seem to be any savings for purchasing in bulk. There is also the hassle of where to legally put a bulk gasoline tank because of zoning not to mention insurance concerns and a bulk gasoline tank being a theft target, shelf life, etc. 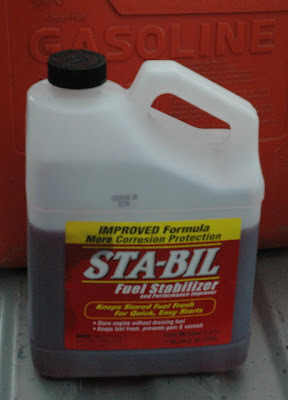 I add a product called Sta-Bil to all my portable gas tanks when I fill them following the directions on the label. I add extra directly to the fuel tank when it may be a longer term storage situation. 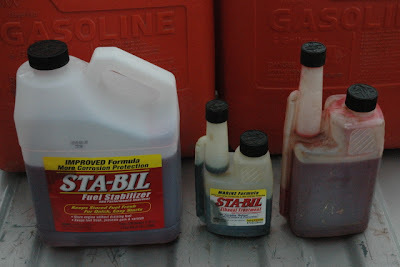 So towards the end of the various seasons I add extra to the particular fuel tank when I put fuel in it which is in addition to the regular amount I add every time I fill the portable gasoline tank. 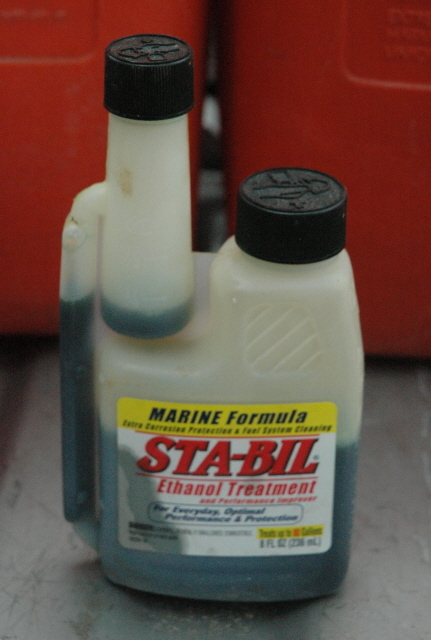 There are several different products including a marine version, ethanol version, etc. I read the labels on these products before I buy and use them. I have tried several brands but I use the plain red Sta-Bil and it seems to work fine. It is sold in gallons and quarts. I buy it in gallons and I reuse the plastic quart dispenser that they sell it in as it makes measuring and adding it at the pump or gas tank fairly easy. A small funnel makes it easy to pour from the gallon into the quart dispenser. I add the stabilizer product to the portable tank before I fill it with fuel usually. The tube on the left has markings for the amount in the tube. Gasoline with ethanol in it has a shelf life. It seems like 45 days is the number I hear most often. I make it a point to off season store most of the toys with around 1/2 tank of gas in them. Then I fill the gas tank when I'm going to use the motor again. This seems to help to minimize the effects of storage on the gasoline. It seems that products like Sta-Bil and others help to lengthen the shelf life of gasoline. Some things like small lawn mowers, weed eaters and chain saws it may be worth while to run the gas tank empty before you put them away for the off season or an extended period of time. Decide this for yourself. Some outboard engines like the Evinrude E-Tec now come with an in line fuel filter. I'm not sure when they started this practice. For awhile we were putting a large in line fuel filter on Dyna-Ski boats. I added one to my old 1987 Hydrodyne many years ago. It has been trouble free and there have been several engines on that boat. These products are still in the various marine catalogs if you want to add one to something you own like an older boat and motor perhaps. There is nothing worse than having trouble with a recreational product when you are going to have some fun and relax. This would be a bad way to start a vacation. Then when you have spent a bunch of time and/or money and the problem turns out to be gasoline related you may want to change your ways. I learned this early and so far I have avoided major problems, knock on wood. I do my best to point my friends and Dyna-Ski owners in the right direction from the start. 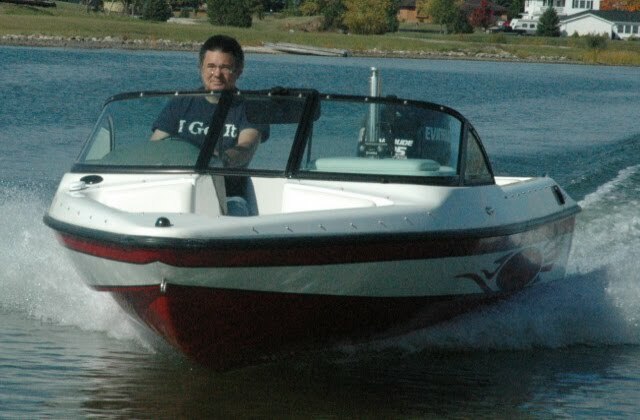 The gasoline I put in all the water ready Dyna-Ski Boats is the mid grade non ethanol gasoline from Fleet Farm as I drive by one going between the home office and the boat shop. If you want to try it before you buy it? How long does it take to build a boat?